1. The Fourth of July was not actually considered a holiday until 1941. 2. Benjamin Franklin originally suggested that our national bird be a turkey, but was overruled. With turkey being the star of Thanksgiving, we can't imagine it would go over too well to cook our national bird every year. 3. Around 150 million hot dogs are believed to be consumed on this day. 4. The Declaration of Independence was signed by 56 men from 13 colonies. 5. In 1776, around 2.5 million people were living in United States - today, there are over 311 million. 6. The "Star Spangled Banner" was actually a poem written by Francis Scott Key. It was later put to music but wasn't the official national anthem until 1931. 7. The sale of fireworks has increased by 700 percent over the last 35 years, but injuries are down by 90 percent. 8. The 2nd of July is the day that Congress voted for independence - making it the real Independence Day. However, they didn't complete the written document until the 4th. 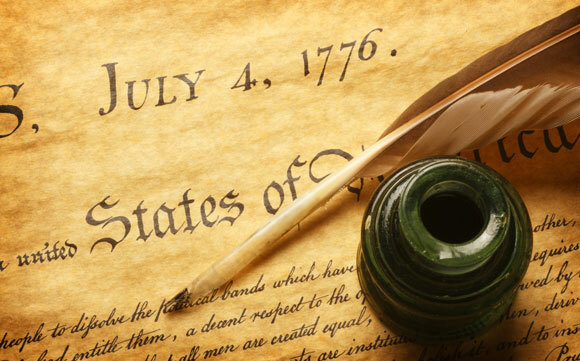 The Fourth of July was printed at the top of the document and was widely circulated, making everyone believe that the 4th is the actual day of Independence. 9. John Hancock wrote his name twice the size of any of the other signers and also added a flourish. It's said that he did this so that King George III would be able to read his signature without glasses. As you celebrate this momentous moment in our country's history, we hope you take a moment to enjoy these 9 fun facts about Fourth of July with your friends and family. We have a truly beautiful and rich history - one that is great to share! Here at Brighton Ford, we are proud to sell American vehicles to our community. That's why we have a large selection of New Ford Trucks and Certified Preowned Cars For Sale at our New Hudson Area Ford Dealership. Stop by today and let us help you into the vehicle of your dreams! Brighton Ford is located at 8240 Grand River Ave. just north of I-96 in Brighton. We are a family owned and operated business that strives for customer satisfaction. For more information on Brighton Ford visit BrightonFord.com or give us a call at (800) 836-8206.